Back in the early years of this decade, when cloud computing really reached the beginning of its hype cycle, countless vendors were promoting their cloud solutions and services. Yet, several obstacles stood in the way of progress, including security, interoperability and standardization, connectivity and access, service quality, and of course long-term cost models. These obstacles have since been overcome – to the degree they no longer present a deterrent to cloud adoption. Standards have improved and there is plenty of ongoing interop work between vendors across industries, and APIs have become a common language in the tech space. Connectivity has improved dramatically and we’re now on the cusp on a major leap with 5G deployments looming. All of these have driven consistency in service quality that has helped increase adoption of cloud services. Security has become an even bigger issue, but not one that’s unique to cloud providers, but one that impacts every provider, business, and individual user on a daily basis. Security risk has, one might say, become a technology standard, but one that cloud providers are often better equipped to handle than most businesses. The maturation of cloud services has brought about an entirely new business mindset – and a host of thriving new providers delivering cloud-based communications, contact center, networking and IT, and even security services. While the industry has matured and large enterprises, too, are moving increasingly into the cloud, the model still holds tremendous value for the SMB market, where IT resources are at a minimum. Many of these new cloud-based providers are taking the approach that simplicity is key – that the value of cloud is muted when there are too many deployment requirements, from minimum licenses, edge devices, and so forth, which still require in-house IT support. Businesses are looking for simple to deploy and simple to manage services at an affordable cost. Natsis spent almost six years at what was formerly Interactive Intelligence, which has since been acquired by Genesys, so he has a solid understanding of what businesses are looking for in a cloud solution. Part of the model includes speed of deployment, which the company feels is often complicated by vendors in order to meet specific revenue targets. ZaiLab’s record for a 10-seat deployment is five minutes, 35 seconds. The key is there are no setup fees, no implementation costs, and no ongoing maintenance. Billing is done on a per-second basis for voice, and per-message, per-email, per-web session billing for other interactions. If you’re wondering about the cost model, one customer in the insurance market thought it had been under-invoiced upon receiving its first bill and called ZaiLab to verify. To the customer’s delight, the two-thirds reduction in cost was, indeed, accurate. The model is ideal for the SMB market (2-200 seats), which has always seen a barrier to get into a contact center deployment, yet are very much in need of the same capabilities afforded to larger competitors. ZaiLab can scale to meet any business’ needs, but larger companies tend to have different requirements and in-house teams to manage software, making the model less attractive for them. Part of the secret is AI-based routing. Voice has always been the channel that requires immediate response, but ZaiLab treats all interactions equally, sending all inbound channels into the same virtual waiting room, where the system performs optimized routing based on agents’ skills. It’s all designed to create the best customer experience within an omnichannel environment. In addition, ZaiLab is investing the agent community. The company has already created a training facility to certify home-based agents in South Africa, and is now in talks with the U.S. Chamber of Commerce to introduce a similar project here. 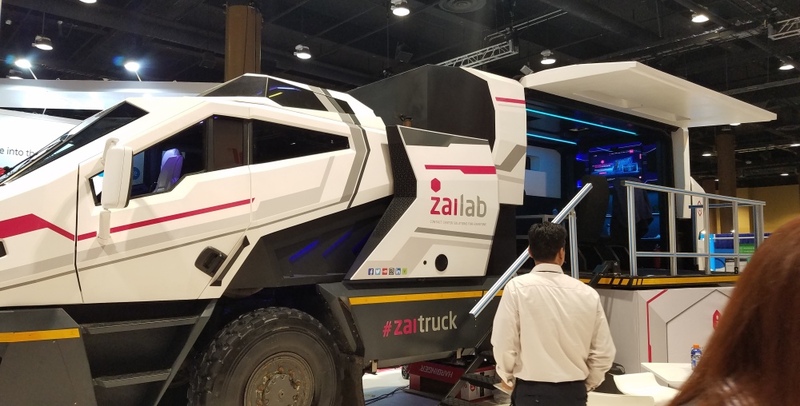 While most people are afraid of AI and fear it will cause job loss due to a need for fewer agents, ZaiLab sees it as an opportunity to use the training and certification process to create opportunities, especially for new workers, pensioners, retired military personnel, and others who may otherwise have a hard time finding employment.